It may have been out for almost three months now, but, thanks to the sheer number of things there are to do in the game, a lot of people are still playing Fallout 4. For those who are continuing to explore post-apocalyptic Boston, a new update has been just been released which brings such a large number of improvements it may tempt lapsed players to return to Bethesda’s world. Patch 1.3’s biggest feature for PC gamers is the introduction of a new ambient occlusion setting (HBAO+), which should add some richer, more detailed and realistic effects to the game. Owners of Nvidia GPUs, meanwhile, will now see new weapon debris effects. There’s also improved “ESDF” remapping support in Workshop mode. In addition to the visual improvements, the patch will add a status menu for your settlers and fixes a number of bugs, including one that stopped players from progressing in the game’s story by locking off the Railroad resistance group’s headquarters if certain tasks were completed in the ‘wrong’ order. It’ll also stop your companions from being permanently stuck with radiation poisoning and fixes “an issue where Vault 81 residents would not dismember correctly,” which is something everyone will surely appreciate. 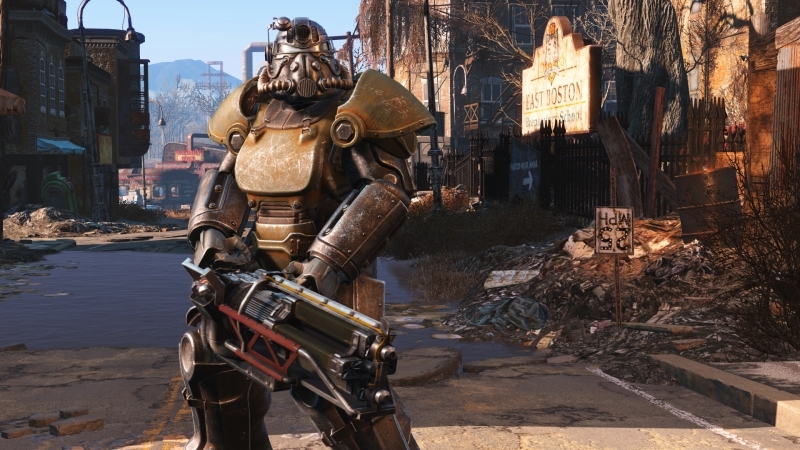 Fallout 4 should run a lot smoother once the update is installed, and structures in the workshop mode will snap together a lot easier – an issue many people found annoying. If, like me, you recently left Fallout 4 to move onto new titles, then you may want to boot it up once again to see how much effect this patch has. It could add quite a few more hours of life to the game before the DLCs start to arrive.